Welcome to my second blog post of December! December is the month of magic that is filled with joy, cheers, and love. Christmas songs are playing all day on the radio. Ladies all over are getting together to bake traditional Christmas cookies. 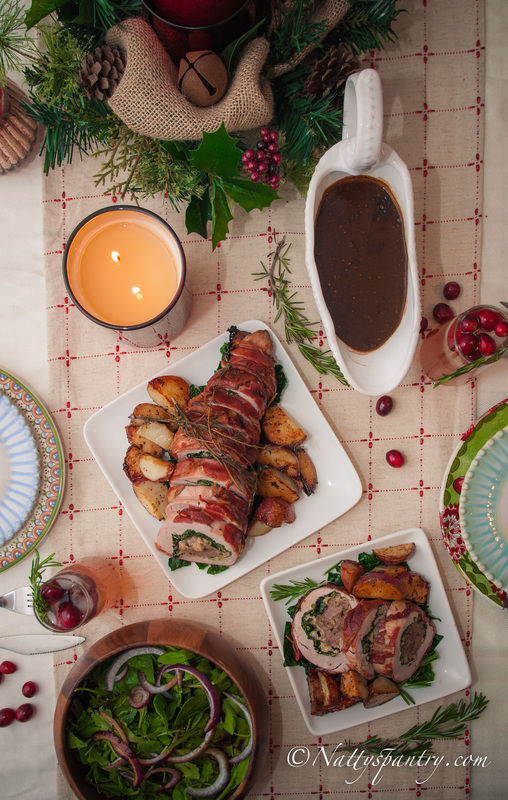 Some are making Christmas shopping plans, and some are planning their perfect Christmas dinners. We all know about some of the Christmas traditions; some of us eat turkey, some ham, some prime rib, and some roast lamb on Christmas Eve. 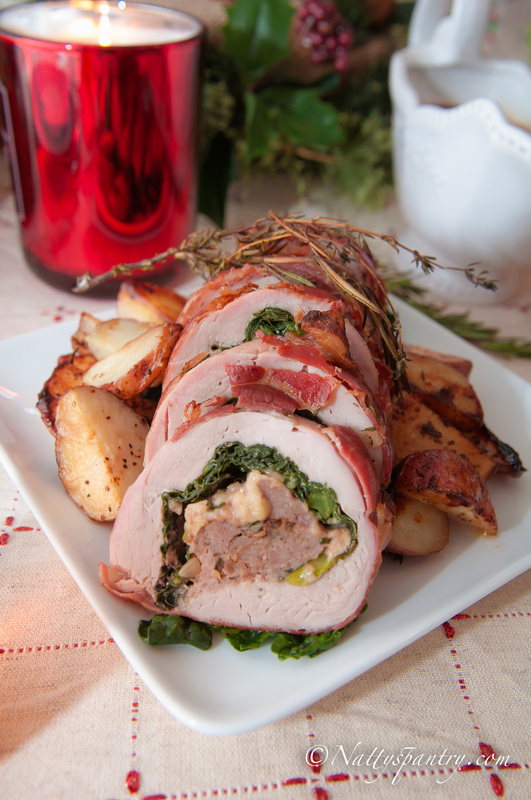 This Christmas I want to try something new and " Proscuitto Wrapped Pork Loin with Kale and Italian Sausage Stuffing" is something that fits right in! Also, this can be the best leftovers for the next day as it is good to make Italian Pork Loin sandwiches with! Simply layer the pork on your favorite bread, add salad leaves, pesto, onion, and some goat cheese. 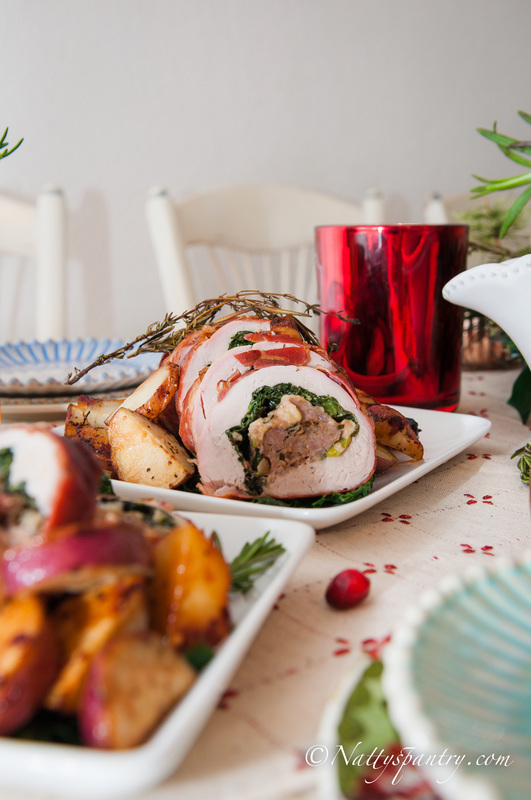 This recipe is great to serve for Christmas Dinner as it serves up to 8 people. I served it with roasted potatoes, and you can add cooked collard greens or a green salad on the side. 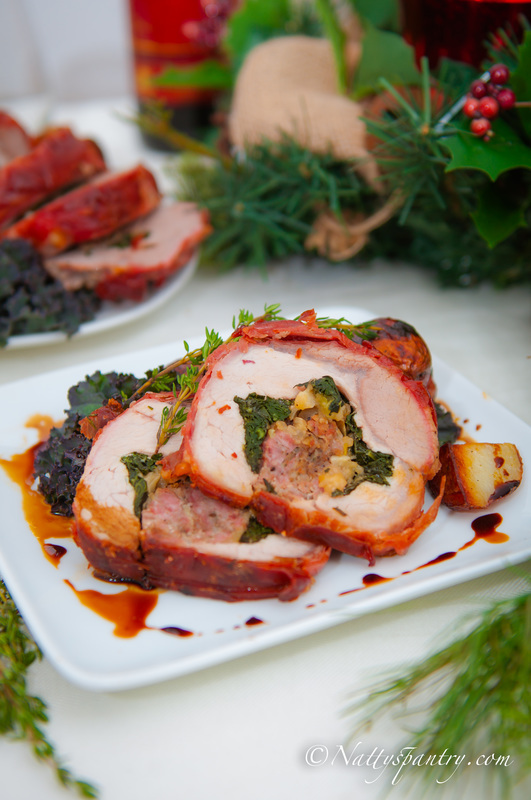 Or you may served this pork as part of sandwiches such as they do in Italy. This post was done in partnership with Whole Foods Market Chicago, who sponsored me with the ingredients and helped to make this post happen. For this time of year, there are many main holidays coming up. Whole Foods Market would like to celebrate in the cheers, joy, love and support of all the holiday traditions. Since Christmas revolves around food, Whole Foods Market has a special gift for you! Of course, it involves food to give thanks for all of you that have been the greatest supporters, and supporting you all to eat healthily. Whole Foods is giving away groceries for A YEAR to the winner (and one of the winner's friends) of the CONTEST! Yes, dears. What you read is right... Groceries for a year for you and your friend! This is super-easy, and all you have to do is CLICK Here -> THE CONTEST, and put your name, email address and zip code // for a chance to win the prize. Good Luck to you all! Thank you for supporting Natty’s Pantry! And a BIG thank you to all of my awesome sponsors, especially Whole Foods Market Chicago. Special tool needs: temperature thermometer and a meat mallet. 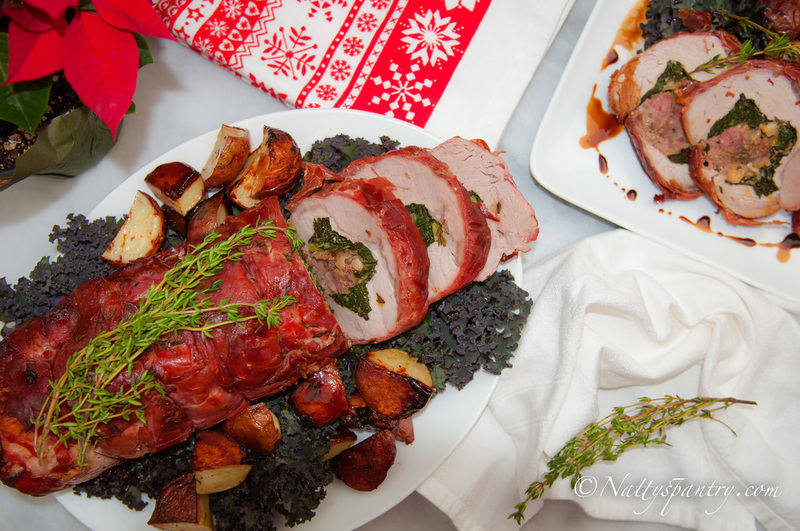 Pork roast can be prepared 1 day AHEAD. Cover with plastic wrap and chill. Let stand at room temperature for 1 hour before cooking. It the red potato you have on hand is the big size you can cut them in quarter. Fill a large pot with water and salt; bring water to a boil over high heat. Add kale to the boiling water and blanch; happens in about 2 minutes. 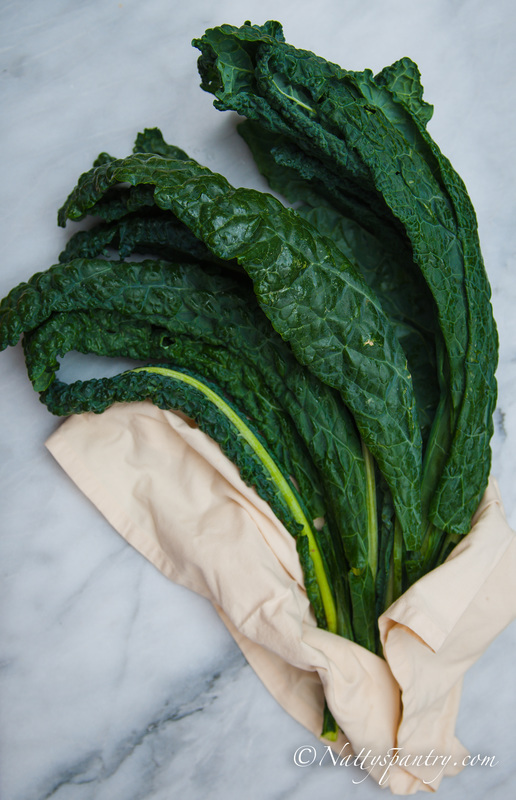 Remove and drain kale; set aside. In a large pan over medium heat add olive oil, butter, and ½ teaspoon of salt; once the butter has melted add onion and saute until lightly golden in color, about 8-10 minutes. Add garlic, thyme, and rosemary; cook for about 1 minute. Add bourbon and continue cooking until liquid has reduced by half or absorbed with the vegetables and herbs, about 1 minute. Season with 1 1/2 teaspoons black pepper. Transfer the mixture to a bowl and set aside to allow the mixture to cool completely. Once it has cooled completely, combined the mixture with sausage until well combined. In a small pot over low heat, simmer Balsamic vinegar and honey until the mixture has reduced, about half. The syrup should lightly coat the back of a metal spoon.Transfer to a little bowl. Set aside. Butterfly your pork loin, so that it is about 1/2" thick. 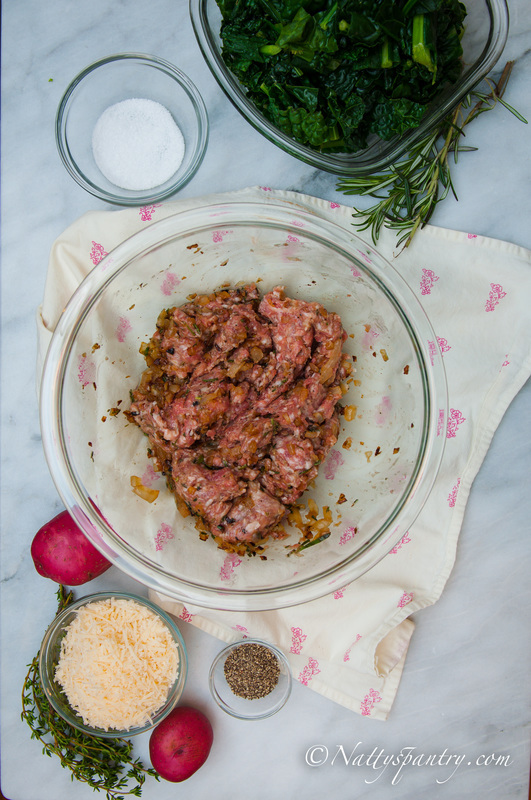 Remove plastic wrap and season pork with 1/2 teaspoon salt and ½ tablespoon black pepper. 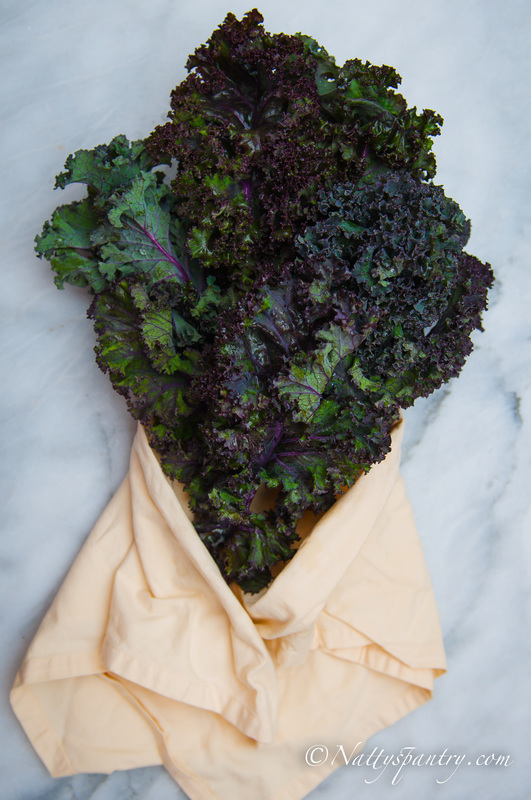 Evenly layer with kale leaves and layer next with Parmigiano Reggiano. Then evenly spread the cooled Italian sausage mixture on top of the Parmigiano Reggiano. Starting at one end roll the pork and layers tightly into a cylinder towards the other end. 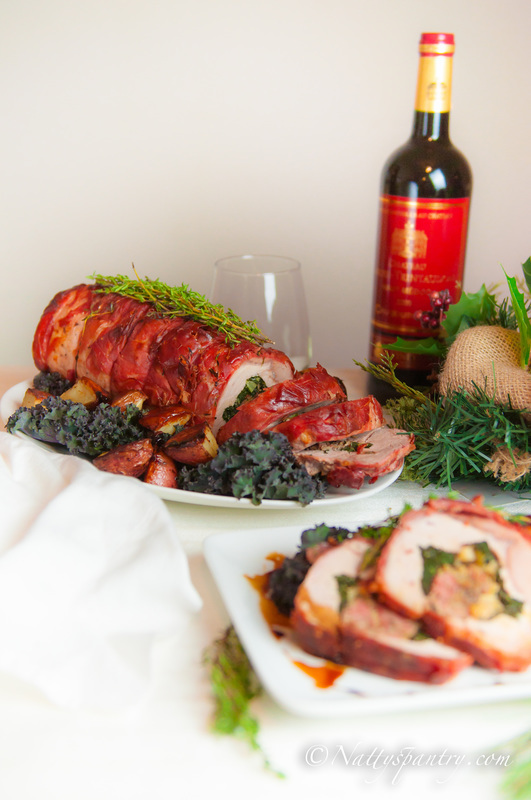 Wrap the outside of the pork cylinder with premium Prosciutto. 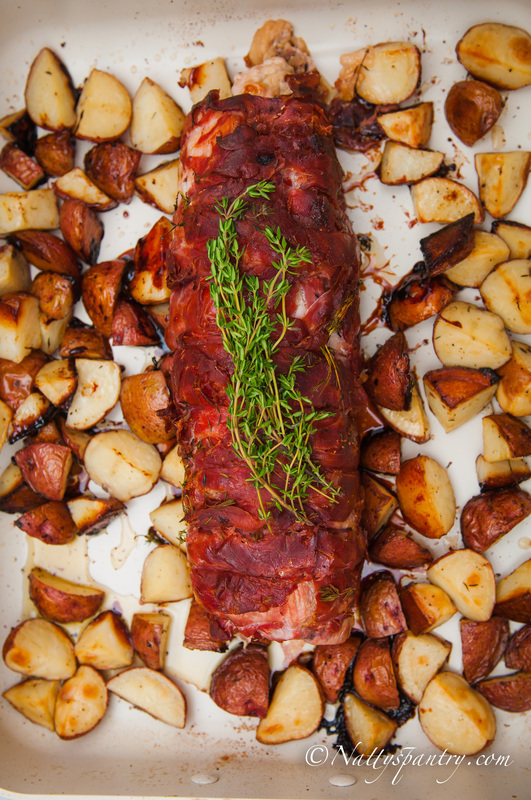 Tie the pork roast with butcher’s/kitchen twine every 1" inch apart down the whole pork roast. Tuck fresh thyme sprigs under the twine. Set aside. In a large skillet over medium-high heat, melt 1 tablespoon of butter. Once the skillet is hot or you start to see little wisps of smoke, add the pork roast and brown on each side, about 5 minutes. In a large bowl with red potato, ½ teaspoon of salt, 1 ½ black pepper, and 3 tablespoons of olive oil. Mixed all ingredients together, make sure that olive oil coat the red potato evenly. 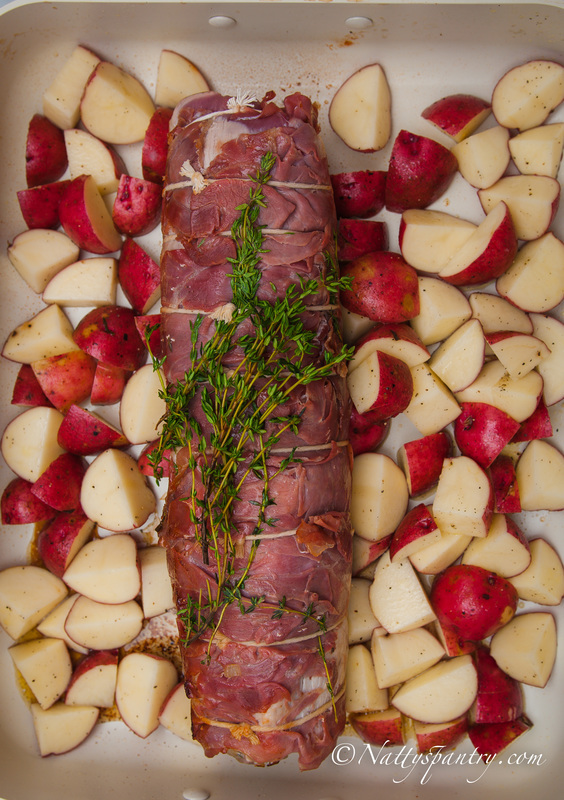 Place the halved red potatoes in a roasting pan, then place roast pork in the middle of potatoes. 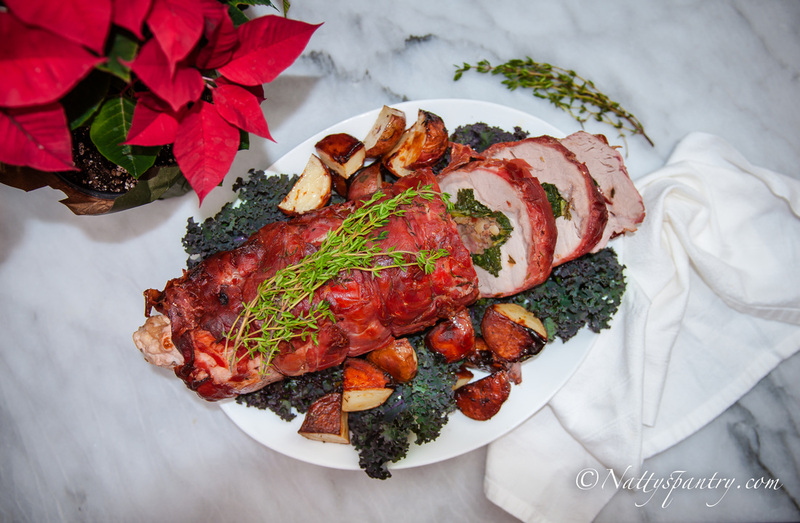 Roast pork until it registers an internal temperature of 140F (for medium or slightly pink) or 160F (well done), about 1 hour to 1 hour 15 minutes. Allow the roast to rest 20 minutes before cutting, so the internal juices don’t escape and leave it dry, but rather stay within the meat itself.